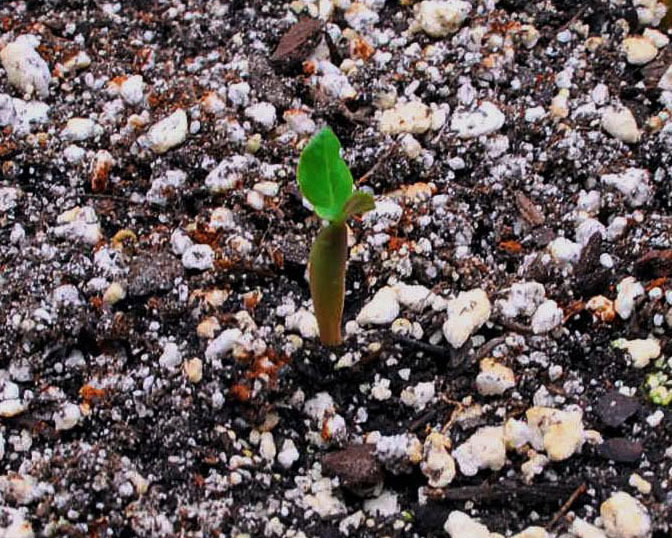 It normally takes about 3 to 4 days for the first seeds to start pushing through the soil cover. When they started doing that in my pot, I thought I had left the seeds uncovered all this time. 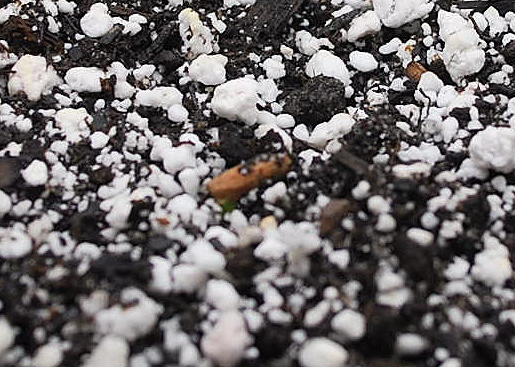 But looking at it with my zoom lens, I saw green bits going into the soil. Aaaah. That’s what “heaving” looked like. Who knew. Now this is the part where some midwifery will be involved. That seed cover is essentially dead stuff. If this was a seed sown in the wild, that seed cover is probably useful as energy source. The natural balance of good critters and bad critters in the soil will ensure neither would overwhelm the vulnerable seedlings. But you’re not sowing in the wild, you’re sowing in what is probably fertilizer-enriched potting soil from the garden center. So take it out, your seedling doesn’t need it. If you leave it there until it drops, fungi may start partying on it and possibly take over your seedlings. Ease the seed cover out in the direction it is pointing, obviously. That will hopefully lessen the resistance. Don't leave it in the pot, by the way. Toss it. You can use a tweezer or even a pin. I have tried both and they work. Just don’t use your fingers if you can help it, or you might pull the whole thing out. I mention that because naturally, I actually managed to do just that. I wanted to find out whether I can slide the sheath off with my fingers. The whole plant slid out of the soil--root and all. After the mandatory 2-second panic, I grabbed a pencil, poked a shallow hole into the soil and very gently put the seedling back in. That particular plant survived the manhandling and is still alive, thank you. Keep misting the seedlings when the surface feels dry to the touch until all seeds have germinated. My arbitrary cut-off is two weeks, by which time all successful seeds should have already germinated. I am sure there are folks out there with the patience to wait longer, maybe six more years. I dont. So I'm calling it an 87.5 percent success rate (7 seeds out of 8). My obesums sprouted within days of each other, by Day 7, they were all out except one. My arabicums, on the other hand, were a different story. The first batch was a stunning failure---only two came out. Germinating in a sealed container without airholes, they were quickly overwhelmed by the green mat of goo so thick that they had to be transferred to another pot after only a week. My second attempt at Adenium arabicum seeds was more interesting. Following exactly the same procedure, I got 7 sprouts out of 10 seeds. Unlike the obesums, however, the germination process took a total of 19 days. After two weeks, check out the differences between these seedlings, all planted at the same time. The last one germinated long after I have had to remove the lid--early sprouters were pushing it up. 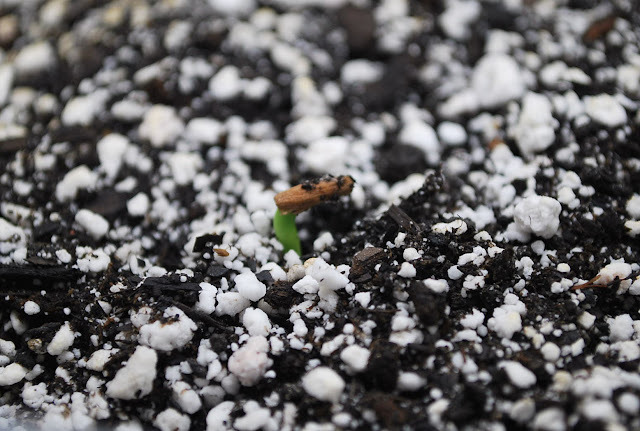 The first two seedlings are the same size as the seeds sowed two weeks before. Plants do what plants do. Go figure.